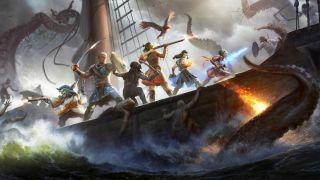 Hands-on with Obsidian’s next fantasy epic. Firebeard is a dwarven swashbuckler with a sideline in assassination and thievery. He’s charming, cunning, and streetwise, but intelligent and well-traveled too, with an intellect as sharp as his rapier. This is the character I’ve created for my first foray into Deadfire, the sequel to Pillars of Eternity. I take advantage of the new multiclass system and make my red-bearded hero a fighter/rogue, with a shadowy criminal past that gives him buffs to stealth and perception, as well as a knack for using pistols and swords in combat. An ideal character, I think, for a game that sees you captaining your own ship and sailing the high fantasy seas of the Deadfire Archipelago. I arrive on the remote island of Tikawara, home to the Huana. They’ve lived here for thousands of years, but their way of life is being threatened by the arrival of seafaring explorers—including the Vailian Trading Company, who seek to make a profit in the region. Disembarking from my ship, I meet a concerned-looking man called Vektor on a wooden dock. Noticing that I’m a fellow mountain dwarf, he seems relieved. “How long I waited for a familiar face in this friendless hovel!” he exclaims, eager to share his predicament with me. A member of the aforementioned Vailian Trading Company, Vektor sailed to Tikawara with his crew searching for luminous adra. Adra is a precious crystalline substance in Pillars’ world that grows out of the ground. But the crew disappeared while investigating a nearby island to the east, Poko Kohara. I lie to Vektor, telling him the Company sent me to investigate, and ask him if there’ll be a reward for my efforts. A little mercenary, sure, but that’s how Firebeard rolls. The dwarf points me towards a nearby lodge where he says the village chieftain will have more information about the mission at hand. I walk through the quiet, idyllic village, which is decorated with immense wooden carvings of seabirds and angler fish. Lights dangle from the huts, casting a soft blue glow over the party and making our shadows dance as they bob in the wind. A rainstorm drifts in, drenching the village. I feel like I’m a million miles away from the Dyrwood, the leafy, forested setting from the first game. Eventually I find the chieftain’s lodge: an impressive structure, the largest in the village, elevated on a wooden frame and adorned with elegant, intricate decorations reminiscent of ancient Polynesian art. Ruãnu, the chieftain, welcomes me with open arms. To him, foreign visitors are the key to Tikawara’s growth and survival. He tells me that Poko Kohara is ravaged by strange storms and urges me to investigate. As long as the storms rage, he says, visitors will no longer come to the island and trade with them. On the way back to my ship I stop in at the temple and speak to the priestess, Nairi—but there’s no warm welcome here. She tells me that foreign visitors will lead to the enslavement and exploitation of the Huana, and that she wants someone to destroy the tempting adra on Poko Kohara. With that gone, she thinks, explorers like the Vailians will have no reason to visit the island. I approach a vast stone gate, the entrance to the tomb, and suddenly a pile of rocks quivers with magical energy, forming the shape of a terrifying colossus. And so I’m presented with something of a moral quandary. This is an Obsidian RPG after all, and I wouldn't have it any other way. Do I deal with the storms and clear the way for explorers looking to harvest the adra, and in turn risk the exploitation of the Huana? Or do I destroy it and protect the tribe from outside influence? Firebeard is a wise man, but this will take some pondering. I leave Tikawara behind and set sail for the island. I can decide what to do when I get there, but the idealist in me says destroy the adra, keep the tribe safe, even if I do understand the chief's desire for his people to prosper. I click on the world map to guide my ship across the ocean, carving through a wall of fog. I head due east until I see the landmass of Poko Kohara ahead, and an anchor icon indicating that I can disembark. And here I find the ruins where the Vailian expedition apparently vanished. The area is shrouded in a thick, oppressive fog, and ominous music begins to groan. An obelisk warns me, gravely, that the gods punish trespassers. But I push on into the fog regardless, battling desert wurms, whirling sand blights, and reptilian xaurips as I make the trip across the dunes towards the looming temple ruins. I approach a vast stone gate, the entrance to the tomb, and suddenly a pile of rocks quivers with magical energy, forming the shape of a terrifying colossus. This titan is a remnant of the Engwithan empire, an ancient, mysterious civilization whose ruins litter Pillars’ world. As I battle the towering foe, it grabs party members and slams them into the stone below, doing considerable damage. Only Firebeard is left standing with a sliver of health when the colossus finally crumbles, and I make my way into the darkness of the ruins. I’ll let you explore this dungeon for yourself when you play the game, but as well as fighting scarab beetles, giant spiders, and all manner of angry supernatural beings, I see murals on the walls depicting the Huana and the Engwithans, which is a nice bit of world-building. It reveals just how ancient the tribe is, although the Engwithans don’t come across particularly well in these fading pictographs. In one a Huana tribesman cowers beneath an Engwithan holding a sacrificial blade above him. I make my way through the maze-like, labyrinthine tomb and eventually stumble upon the tip of the luminous pillar of adra. As I descend deeper into the dungeon, it becomes clear that the adra is corrupted. The lower parts have a tinge of red and have lost their glow, which leads me to a discovery that explains the source of the storms. Again, I’ll avoid spoilers, but I’m presented with a final moral choice, as well as a tough battle against, well, you’ll see. In the end I decide to destroy the adra, and when I do the storms subside. I decide that the Huana will be better off without the Vailians interfering in their lives, because if they can exploit the tribe for profit, they absolutely will—or, if not them, a similarly unscrupulous organisation. The chieftain won’t be happy, but Firebeard’s decision is final. I return to Tikawara and the the news about the adra’s destruction has already reached the island. Ruãnu is furious, telling me that I’ve doomed and isolated his people. But the priestess Nairi is pleased, convincing the chieftain that the tribe will survive as they always have, alone. And if those 2,000-year-old murals in the temple are anything to go by, she’s probably right. I stock up on supplies and head back out to sea on my ship, wondering what my next adventure will be. I’m sure this decision will come back to haunt me later, as it often does in these games, but for now I feel like I’ve done the Huana a favour.